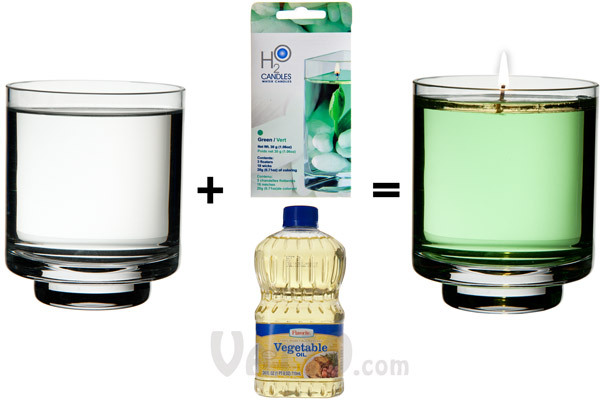 H20 Water Candle Kits: Create colorful candles with water and cooking oil. The H2O Water Candle Kit allows you to create a custom candle with items you already have lying around the house. All you need are the kit, a glass container, water, and cooking oil! 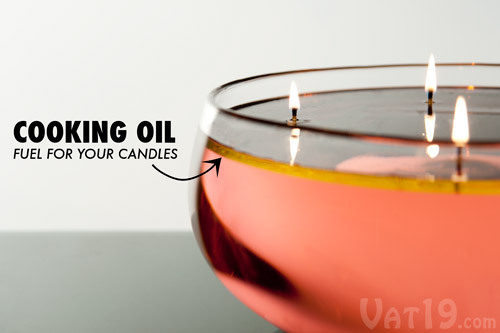 To build your candle, fill any glass vessel with water, add a bit of coloring powder to get your desired hue, pour in a thin layer of cooking oil, and insert the floating wick platform. 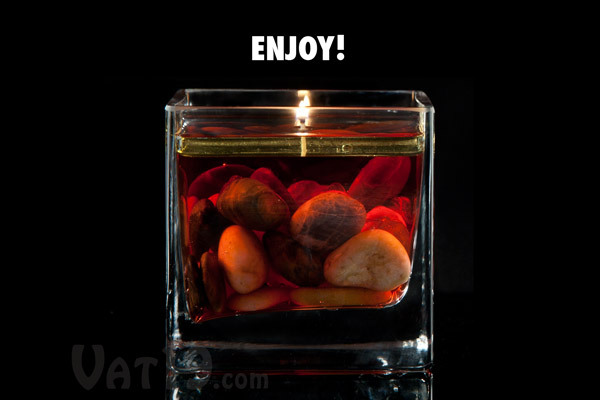 H2O Instant Water Candles create a flame that appears to be floating directly on the surface of the water! It's easy peasy, and a perfect way to personalize any event, whether it's a wedding, baby shower, or just a cozy dinner at home. Available in blue, green, orange, pink, red, and violet. You control the color when making your candle. For a darker hue, add more coloring powder. Each kit will burn for up to 300 hours! 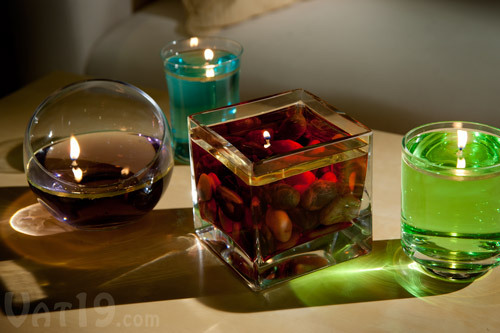 Water Candle Kits allow you to create stunning centerpieces from your existing glassware. Enjoy these colorful accents every day or use them for special events such as weddings, baby showers, and check-out-what-I-got-at-Vat19 parties. Add sophisticated ambiance to your home using your existing glassware. Along with the H20 Candle Kit and a few items you already have in your house, you can create your very own water candle. 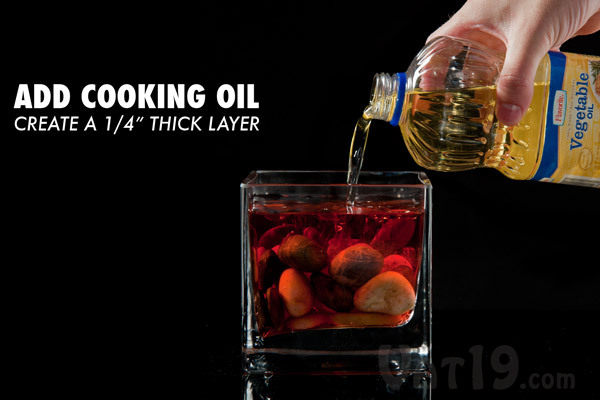 In fact, all you'll need is a glass container, a bit of cooking oil, and some water. The Water Candle Kit, a glass container, cooking oil, and water are all you'll need to create your very own water candle. 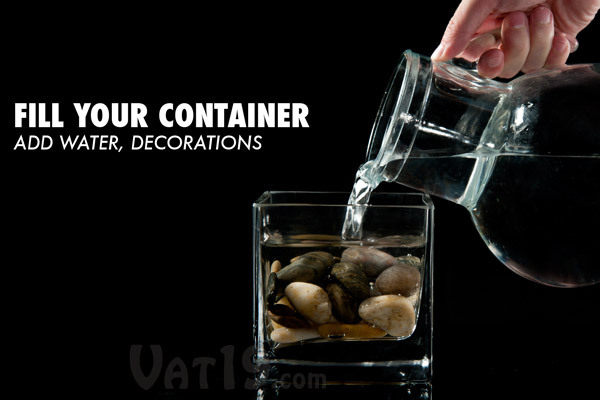 To begin creating your own Water Candle, select a wide-mouth glass container. You can choose to decorate it with rocks, beads, or even flowers. Then add water until it's nearly full. Begin by adding water to any wide-mouth glass vessel. 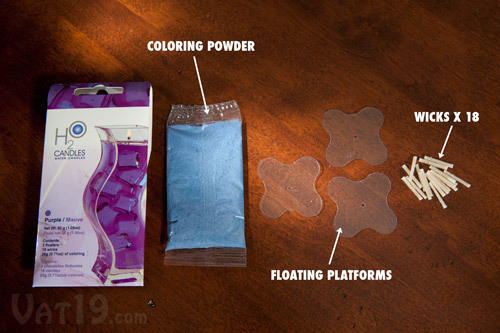 Each Water Candle Kit includes a packet of coloring powder. 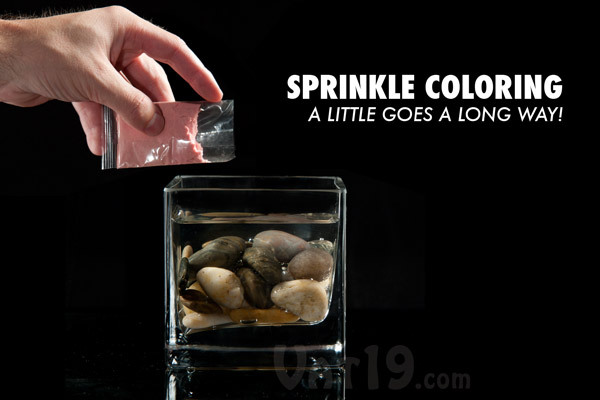 Sprinkle a bit into the container until you reach your desired shade of color. Add a bit of the included coloring powder to your container. The cooking oil is the fuel for your candle. You want to create a layer about a quarter of an inch thick. Add any household cooking oil to your container. Insert one of the eighteen included wicks into the center hole of the floating platform. Spread the cotton fibers of the wick and press it against a hard surface until the platform can stand on its own. It's now ready for flotation! 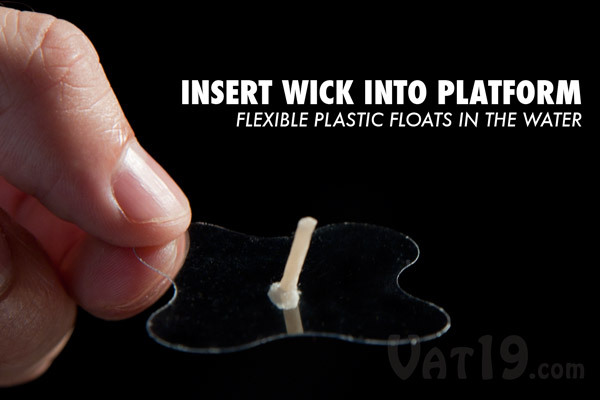 Insert the wick into the transparent plastic floater. Step #5: Light and enjoy! Finally, you will press the floater into the cooking oil so that it rests along the top of the water line. Light it and enjoy! After you place the assembled wick into the container, light it and enjoy. What's so cool about the Water Candle Kit is that everything you need to complete your do-it-yourself candle is already in your kitchen! Just grab a glass container (we've even done it with regular drinking glasses! ), add water and coloring powder, pour in a bit of cooking oil from the pantry, and you're all set! Your floating flames use the layer of cooking oil on the top of the water for fuel. Many parties (especially weddings) have signature colors. You'll have no problem matching your Water Candle to your event's color scheme with the included coloring powder. Simply adjust the amount of powder to match the intensity of the desired hue. Vary the amount of coloring powder to achieve different intensities of color. Kit includes 300 hours of burn time! Each H20 Candle Kit includes 20 grams (0.71 oz) of coloring powder, 3 floaters, and 18 wicks. Each wick will last approximately 16 hours, giving you nearly 300 hours of burn time per kit! Each H20 Candle Kit includes a 0.71oz bag of coloring, three floaters, and 18 wicks. 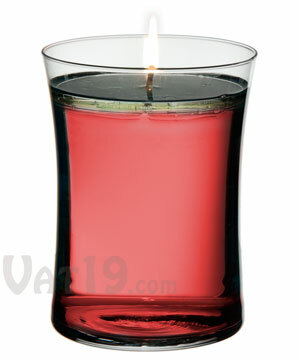 The Water Candle Kits are available in six colors: green, pink, red, blue, violet, and orange. Keep in mind that varying the amount of coloring powder can help you achieve a wide range of hues from each packet. H20 Candle Kits are available in the following colors: green, pink, red, blue, violet, and orange.